I buy way too much of foods that I love – unreasonably too much. I love kabocha pumpkins. And the last time I went to Whole Foods, organic kabochas were on sale. I can’t pass that up right? So I bought the biggest kabocha they had in stock and a smaller one – 12+ pounds in total. When I bought them I felt so good that I whistled all they way home despite the pain in my shoulder from lugging the heavy load. Not too much, I figured. It’s just the two of us, but half of it will be seeds that I will discard right? 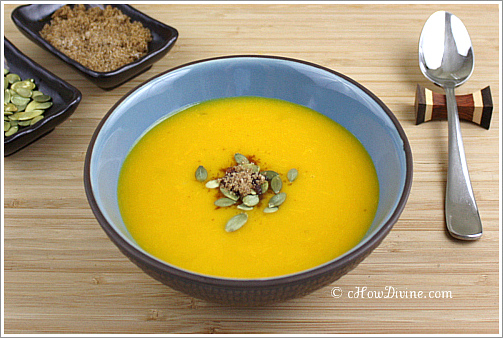 So many possibilities, but I decided to make hobakjuk, pumpkin porridge. It is a simple and delicious porridge with chewy homemade rice dumplings/cakes in it. 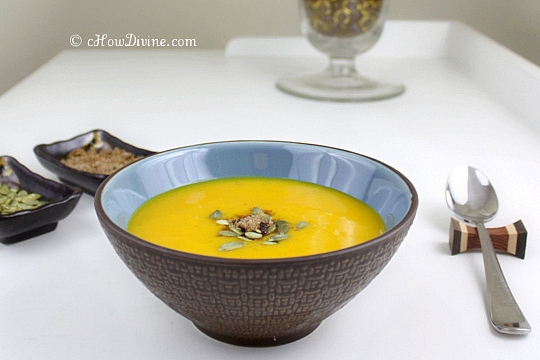 Besides, what’s more Fall than a hearty pumpkin soup or porridge? If you have any cooked pumpkins or sweet squashes left over from a meal (hopefully not as much as I did), this is an easy way to make good and tasty use of them! I’ll be spending the next few weeks with my family. We haven’t had a gathering in over a year. I’m so looking forward to seeing my nieces, nephews, mom, et al. I hope you too are keeping warm, eating good food, and are surrounded by loved ones. Place kabocha pieces on a steamer. Steam for 20 minutes. Let it cool. 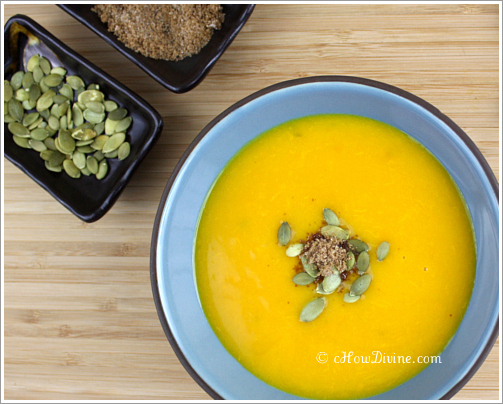 Add the steamed kabocha to a blender. Add 2 cups of water to the blender. Secure the lid and process until it is puréed. Pour the purée into a pot. Add 2 more cups of water to the blender and swirl to get the last bits of kabocha stuck to the container. Pour the contents into the same pot. Place the pot over high heat and bring it to a boil. Stir. Lower the heat to medium once the pumpkin mixture comes to a boil. In a small bowl, stir together 1/3 cup sweet rice flour with 1 cup of water. Stir in the flour+water mixture into the pot of pumpkin mixture. STIR well to prevent lumps from forming. The contents should thicken up right away. Bring it to a boil. Once it comes to a boil, lower the heat and let it simmer for 10 minutes. Stir to make sure nothing is sticking to the bottom. Add water if it gets too thick. Stir in brown sugar and salt. Add the rice balls to the pot, let it cook for about 5 minutes on low boil. Don’t overcook; the rice balls will become mushy. Rice balls should be cooked through and chewy (kind of like mochi). Remove from heat and serve. Salt to taste. Taste test first before adding additional salt. Pumpkin seeds and additional brown sugar can be added if desired. 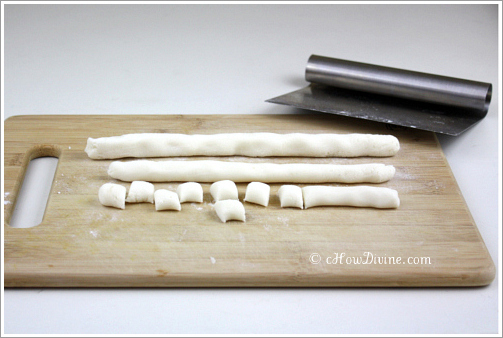 Combine rice flour, water, and salt. Knead until you achieve a dough with the consistency of soft play-doh. 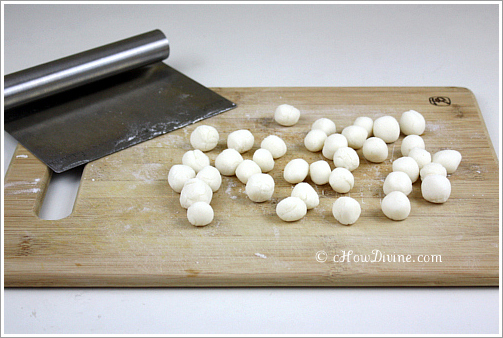 Form dough into 1/2-inch balls. The dough should yield about 20-25 balls. Love the vibrant colour of the porridge. And with the chewy dumplings? Sounds good! Does it make a difference if I boil the pumpkin instead of steaming it? You can boil the pumpkin/squash also. I just had some(well, lots) steamed pumpkins on hand 🙂 So go ahead and boil it. The pumpkins should break up with a little coaxing from a wooden spoon after about 20 minutes or so. If you want it completely smooth, use a hand blender to blend smoothly before adding rice flour. And yes; the rice dumplings are just chewy pieces of goodness! I, too, can’t get enough of kabocha. Love its sweet nature. It takes so well to so many cooking methods, too. Definitely trying this soup with the heavenly dumplings. Aren’t they great? I try to eat them as much as I can during fall/winter squash season. So glad you are going to try this! Oooh, this sounds lovely. When pumpkins start coming into the markets, I’ll have to make this! My dad would love it. He keeps telling me to make him gongee, but juk should do, right? 😉 For your rice dumplings recipe, would those same rice dumplings work well in ddeokbokki? I’ve had a hard time finding fresh ddeok after moving (my old city had a market that made them fresh) and frozen ddeok just don’t do the same thing for me anymore. Juk and congee are similar. But this particular juk is made of rice flour instead of rice. There is Jaht Juk which is made of rice however. The rice dumplings for this recipe would not be appropriate for ddeokbokki, because it’s too soft/loose for that. It would be way to mushy if you cook it too long. These are meant to be cooked for a very short amount of time for their softness and chewiness. Try soaking your frozen ddeok for a longer amount of time to get some of the starch out and also to soften them a bit. You can also try boiling them really quickly to get more of the starch out while softening the ddeok. This will help when you make ddeokbokki, because the ddeok will already be a little bit softer when you throw it in the pan. Sometimes, if you try to soften them to your liking from their frozen state, the ddeokbokki sauce will become WAY TOO gummy and thick from all the starch they let out.